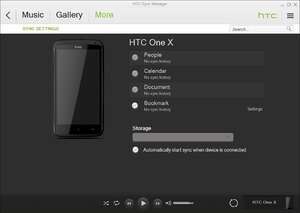 HTC Sync Manager is a comprehensive PC suite for Android phones manufactured by HTC. The application supports most HTC-branded devices and provides all of the file transfer tools and synchronization tools you would expect in such a PC suite. The main interface of HTC Sync Manager provides for synchronization of people (contacts), calendar (Google), documents and bookmarks. The interface also provides specialized transfer of music and gallery (photos and videos). Version 3.1.88.3 is a freeware program which does not have restrictions and it's free so it doesn't cost anything. For security reasons, you should also check out the HTC Sync Manager download at LO4D.com which includes virus and malware tests. Additional screenshots of this application download may be available, too.